Why should you choose AHSS? Our evidence-based Applied Behavior Analysis (ABA) programs are individualized every step of the way to help your child achieve his or her full potential. We provide reliable supportive autism therapy services in BOTH the home and center environment depending upon your child’s needs. From our unique Family Support team and in-house insurance team to our passionate, trained therapists, AHSS assists families throughout the entire experience. We work with your school and existing therapy team, such as your Developmental, Occupational, and Speech therapists. Our team of insurance specialists works directly with your provider to verify coverage and manage your claims. In addition, our Family Support Team will help you understand your coverage and out-of-pocket expenses for autism therapy services. Surveys show 92% of our clients would highly recommend us to their friends and family. We regularly receive referrals from the nation’s most well-respected doctors and autism community leaders. 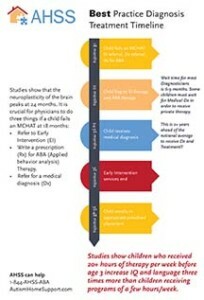 Through intensive ABA programming, supported by online session reporting, data collection, and regular progress meetings, our team delivers real, measurable progress toward hopes and dreams. 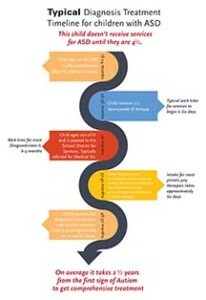 Click on either of these images to see full document of best practice diagnosis treatment timeline. AHSS can help!